Why not jump start Spring with a trampoline:Please place your order soon to ensure current sale prices. 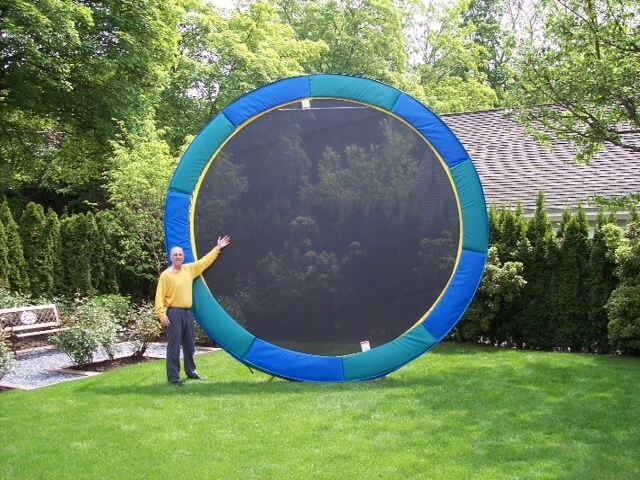 As some of the trampolines are considered custom, please consider ordering a few weeks before you'd like the trampoline. Notice:- Please read about our shipping rates. Shipping charges are $125 (BC), $175 (AB), $225 (SK & MB), $350 (ON & QC), $450 (Maritimes) $500 (NFLD & LD). Notice:- Add $100 surcharge to non-direct or more remote locations. Enlosures add $50-$100 to the trampoline shipping rates (depending on destination). If ordering parts, trampoline jump mats ship within Canada for $30 and to the USA for $50. The trampoline frame pads vary so much in weight and dimensions that we need to get a shipping rate on a case by case basis. The same applies for rebounders. Shipping charges don't apply to the Dr. T Patch kits, as they just ship by regular mail with no tracking number. The 14' Gold Medalist is comparable in performance, quality, and safety to our best quality rectangular trampolines. This trampoline makes an excellent choice for the whole family and will provide many years of fun, entertainment, and trouble free service. With its heavy duty construction, it is also recommended for commercial and resort use. This model is also available in a 12' size at $1395. Enclosure sold separately. JUMPING SURFACE: (112 Sq. Ft.) Sundance sets the industry standard. Made of highest-grade, non-abrasive, polypropylene mesh, this totally weatherproof fabric can be left outside, sun, rain, or snow. It is designed for permanent outdoor use. SPRINGS: (100-8.5" long) Absolutely the best in the industry! These high performance, heavy duty, galvanized steel springs will last for many, many years. SAFETY PADS: (1.5" x 13") Made from the finest outdoor fabrics. A deluxe, full coverage, safety pad. All weather and very durable. FRAME & LEGS: Heavy duty 4 piece, 12 gauge galvanized steel frame, Legs: 4 - 1 piece U-shaped legs. WARRANTY: Full (5) FIVE year warranty. ASSEMBLY: Quick & easy, 30 minute assembly. *Click on the shapes below to see product details. © 2009 Sundance Trampolines. All Rights Reserved.